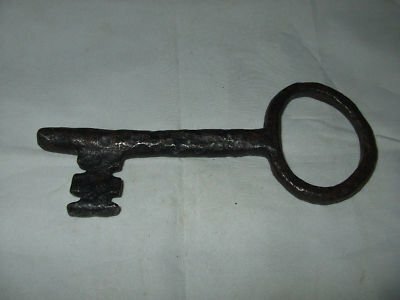 The Geelong Keys were a set of keys discovered in 1845 or 1846 in the time of Governor Charles La Trobe at Corio Bay in Victoria, Australia. They were embedded in the stone of the beach in such a way as to make him believe that they had been there for 100-150 years (~1700 AD). Since the earliest proven English exploration of the area was by Matthew Flinders in 1802, writer Kenneth McIntyre suggested the keys may have originated with some earlier European explorers of the region, possibly Portuguese explorations. The study of these keys was the subject of two pamphlets published by the Royal Society of Victoria in the 1870s. The first of these pamphlets suggested that the depth at which the keys lay indicated an age closer to 200-300 years. The second pamphlet repudiated this claim and was based on an interview with a limeburner who said that the keys may have been dropped down a hole to that depth. The Geelong Keys are often connected to the Mahogany Ship further west on Victoria's Shipwreck Coast also claimed to be a relic of early European exploration of the area. However, research by Geologists Edmund Gill and P.F.B. Alsop showed the age of the deposit in which the keys were found to be 2330-2800 years and this made La Trobe's dating highly implausible. The error by La Trobe is quite understandable, according to Gill and Alsop, given that in 1847 most people thought the world was only 6000 years old. The keys themselves, and all original drawings of them, have been lost. In 1871 Charles La Trobe wrote to the Australasian newspaper regarding a mysterious set of keys that had been found in Geelong some 20 years earlier when he was Superintendent of the Port Phillip District. He had been examining a newly excavated quarry in Geelong near the beach and was struck by a strata of shells a fair way above water level. Obviously either the water level of Port Phillip Bay had dropped over time or the land had risen. Upon remarking on this a workman commented that a set of keys had been dug out from this layer just the other day. The keys were fetched and examined. La Trobe and many since him speculated that they may have been dropped on the beach at an earlier period by previous European visitors. The earliest known English exploration was by Flinders in 1802 but the level of the shell strata suggested to La Trobe a period of several hundred years – a period when it was thought that Spanish and Portuguese ships may have been in the South Seas. Now La Trobe was an amateur naturalist, a keen observer and “a sketcher of no mean pretensions”. He even made a sketch of the keys and there is no reason to believe that such a man would invent the story of the keys. Maybe the Geelong Keys indicate that Spanish or Portuguese sailors had landed on Australia long before Captain Cook. With advances in scientific analysis we should now be in a position to determine the origins of the Geelong Keys. All we have to do is subject them to forensic analysis. So where are the keys kept. Aha, like any good mystery the evidence has disappeared. When the five keys were found they were given to some children. to play with. They lost one and gave one to a passing stranger before La Trobe was able to examine them. Now all keys are lost together with La Trobe’s sketch of them. Well, what about the quarry? It has since crumbled and formed part of the cliff face at Limeburners Point. That returns us to the oral and written records. William Buckley had lived with the local Aborigines and perhaps they might have stories of white men landing long before the English. However I am reliably informed that the only story they had about white men was an ancient legend that one day a great white god would appear in the area and kick nine goals in a losing grand final. La Trobe quotes the shell layer as being about 3 metres above high water level and under about 4 and a half metres of overburden. From today’s knowledge of deposits in the area, that would put it at over two thousand years old – long before modern metal keys. James Harrison noted in the same edition of the paper where La Trobe published his observations that metal objects where often embedded in new diggings to detect the leeching of certain metals. If for instance you came back and found a copper oxide coating on the keys you knew the soil was probably rich in copper. Perhaps they had been secreted there by a wily prospector. But probably the most useful evidence comes from the archives of the Royal Society. In September 1849 Mr R.C.Gunn noted that La Trobe had shown him the two keys (the numbers keep decreasing) and he went to Geelong to investigate the discovery. On questioning the limeburner he found that the keys had not been dug out of the shell layer but found with shells at the bottom of the pit and assumed to have fallen from that layer. In practice they could have fallen from any layer including the top where a Geelong resident of the time may have dropped them. He said that he reported his findings to La Trobe. Perhaps 20 years later La Trobes recollections were rustier than the keys. However papers like Gunn's tend to destroy a good yarn and are thus rarely mentioned. And of course that does do not rule out the possibility that Spanish or Portuguese had landed on this coast or that even a ship may have been wrecked in Victoria - but that's another mystery for another day. Meanwhile the people of Geelong go about their daily lives. Every so often a Geelong wife or girlfriend, during a routine search of their partner’s suit pockets, will come across a set of unfamiliar keys (sometimes with a heart pendant attached). “And where did these come from?” she asks. “I just picked them up off the shells while walking near the beach” he says. “I have no idea who they belong to”. Thus the mystery of the Geelong Keys continues.